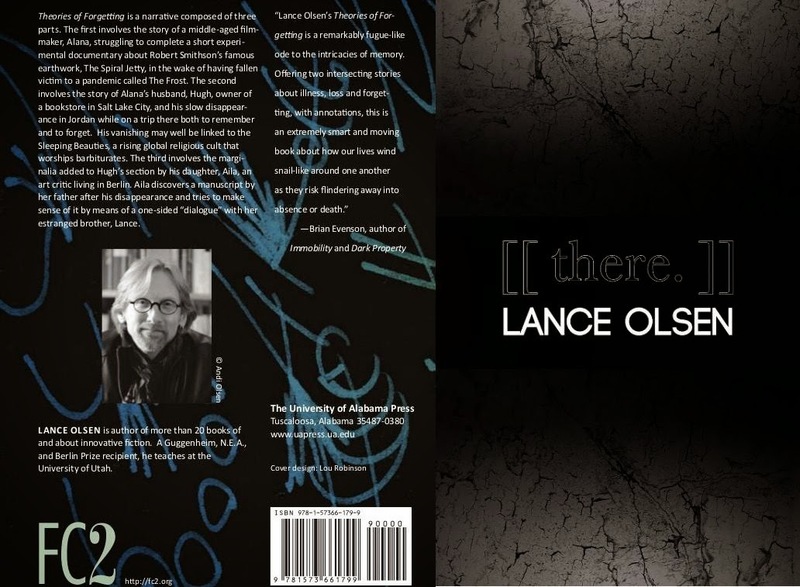 Lance Olsen’s books Theories of Forgetting and [[there.]] are works of radically different type united by their convention-defying formats and their (sometimes uncomfortable) intimacy. Theories of Forgetting is a novel in two halves, two narratives that bisect the book horizontally, never letting you forget one while reading the other. [[there.]] is a book in fragments, echoing David Markson, bursts of observation and contemplation written while Olsen was at the American Academy in Berlin. Reading them together amplifies Olsen’s skill at constructing narratives in unexpected and innovative forms. Theories of Forgetting is the story of a family: a husband, a wife, and their daughter and son, told through mysterious manuscripts and marginalia. The characters try to connect to each other, to hold on to themselves, or to disappear entirely, amid a world of lurking dangers including a quickly-spreading, terrifying disease called The Frost. The book is complex and disorienting, requiring and worthy of intense concentration and effort. The mystery of what has happened to his characters is as compelling as Olsen’s command of each interlocking aspect of the story. [[there.]] is about countless things, each note building on or jumping off of the last, covering vast terrain in Olsen’s mind. The book builds a picture of its writer through art, language, literature, and travel. It shows how travel, and the powerful memories of travel, can draw out aspects of ourselves. In Theories of Forgetting, Olsen (through his character Alana) writes, “People don’t take trips. Trips take people.” It is significant that Olsen wrote [[there.]] while away from home because in it, place and experience become as important as identity. Purchase Theories of Forgetting HERE.